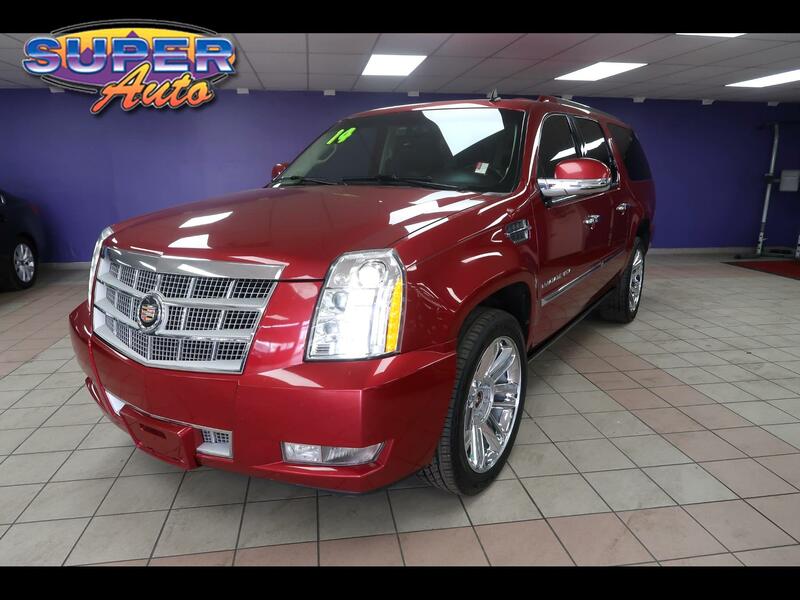 Used 2014 Cadillac Escalade ESV AWD 4dr Platinum for Sale in Denver CO 80204 Super Auto Company, Inc. Features: **BLUETOOTH**, **NAVIGATION**, **BACKUP CAMERA**, **MOONROOF**, **RUNNING BOARDS**, **CARFAX GUARANTEED**, **TOW PACKAGE**, **LEATHER HEATED SEATS**, **TINTED WINDOWS**, **REAR ENTERTAINMENT**, **7 PASSENGER**, Vortec 6.2L V8 SFI VVT, AWD, 2nd Row Power Seat Release, 3rd Row DVD Screen, Dual-Outlet Stainless-Steel Exhaust, DVD Entertainment System, Heated & Cooled Cup Holders, Heated Steering Wheel, IntelliBeam Headlamps, LED Headlamps, Magnetic Ride Control Suspension Package, Platinum Package, Power Tilt-Sliding Sunroof w/Express-Open/Close, Power-Retractable Assist Steps, Preferred Equipment Group 1SD, Rear Seat Entertainment System, Side Blind Zone Alert, Unique Upper & Lower Fascia, Unique Upper & Lower Grilles. Message: Thought you might be interested in this 2014 Cadillac Escalade ESV.